Buying a new concrete core drill is no easy decision. There are a number of excellent brands on the market; there is also different configurations to choose from. Whether you opt for a smaller handheld model or go all out and buy a complete rig with stand, will depend on your individual needs. However, to help you in your search we have brought together 5 top core drills currently on the market. For our findings at a glance just head to the table below. For a dedicated buyer’s guide, plus full reviews of each of our picks, keep on reading. 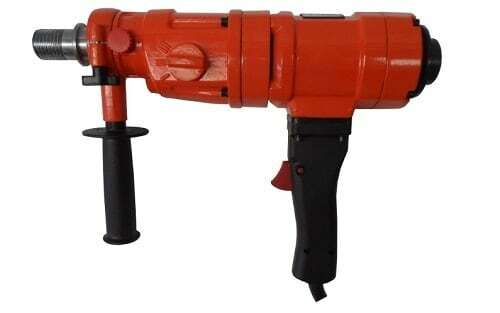 Aluminum Stand Drilling Diameter: 10"
(with Stand) Drilling Diameter: 8"
What is a Core Drill? A diamond core drill is a robust tool that is used to drill holes in hard materials such as brick, concrete, block, and stone. They will sometimes be used by engineers to test the safety of a concrete structure. 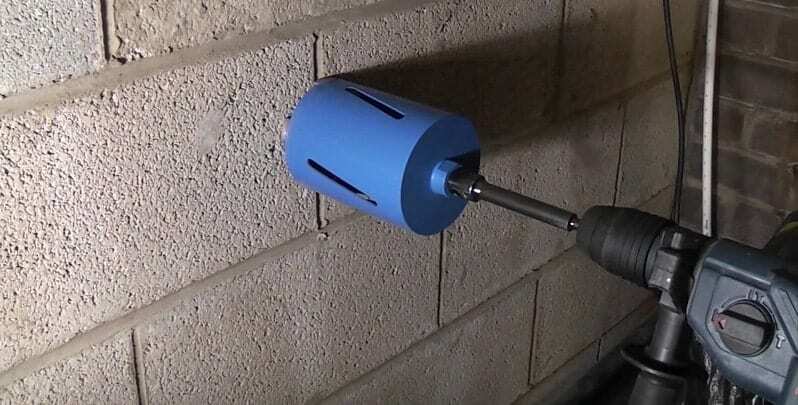 Core testing requires the use of a concrete core drill to drill into and extract a sample for analysis. This means that the tool (along with the correct drill bit) can work with extremely dense materials. Furthermore, the core can be drilled to exact specifications because the tool is able to cut the circumference of the hole without destroying the material on the inside. 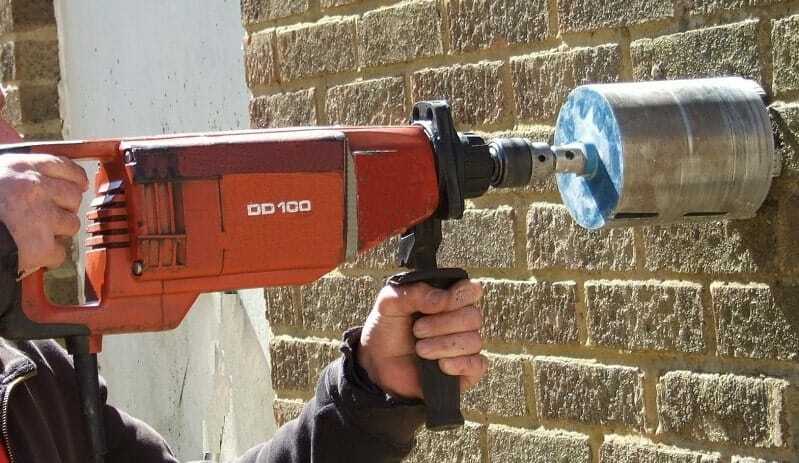 This also makes the core drill ideal for cutting into walls for plumbing pipework. 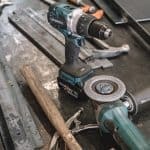 One aspect that needs to be considered with core drills is that they are designed to produce high torque at low speeds; this involves a powerful motor that can make handheld models very cumbersome to use. Also, some core drills require water to keep the drill bit cool. The practicality of this obviously needs to be considered, especially if you are working in a client’s home. When buying the best core drill machine in line with your budget, there are a few issues you should consider first. As we mentioned above, coring drills require high torque at low speeds, and this requires a motor with serious power. Large fully rigged, coring machines are available. This type generally features a heavy motor and a much less portable. They come in a rig like configuration and require a stand to work effectively. Coring drills are also available in various sizes (6mm to 130mm), while 4”diameters suitable for soil pipes are also available. Some coring drill kits will provide arbor extensions, (you can also buy them separately). These extend the reach of the drill so that longer holes can be made. The need for a drill with variable speed will actually depend on your preference. While some users will make good use out of the feature, (when employed properly it can give you greater control over your drilling – especially when used to deliver a soft start); there will be others that will merely set one speed for the job and never touch the dial again. We briefly mentioned the concept of a soft start above. This basically means the tool allows for a controlled increase of rotational speed when first operated. 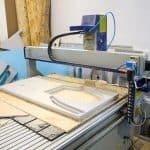 While beginners will appreciate an in built, automatic soft start, some experienced users can get annoyed by the fact they have no choice in the matter. Because of this, many core drills now feature a fixed acceleration, but also include a variable speed trigger that allows the operator to control the rate of acceleration should they feel the need. Large, professional coring drills will normally feature direct drive mechanism to increase performance. If you can afford to go this route it is worthwhile. Such tools will also allow for wet or dry cutting and will have the necessary torque to deal with the densest materials. Even the best diamond core drills will sometimes struggle when driving large cores in thick concrete. Because of this it is important that the motor and drill are protected against over-heating. To counter this, the best core drill machines will have thermal protection. This will shut down the tool should the temperature get too high. This may slow your work down slightly, however that is much better than burning out your expensive drill. The safety clutch is an important feature on the coring drill that should be present on your chosen tool. The clutch basically ensures that you are protected against any kick-back that might occur when a core jams or hits an area that it struggles to cut through. 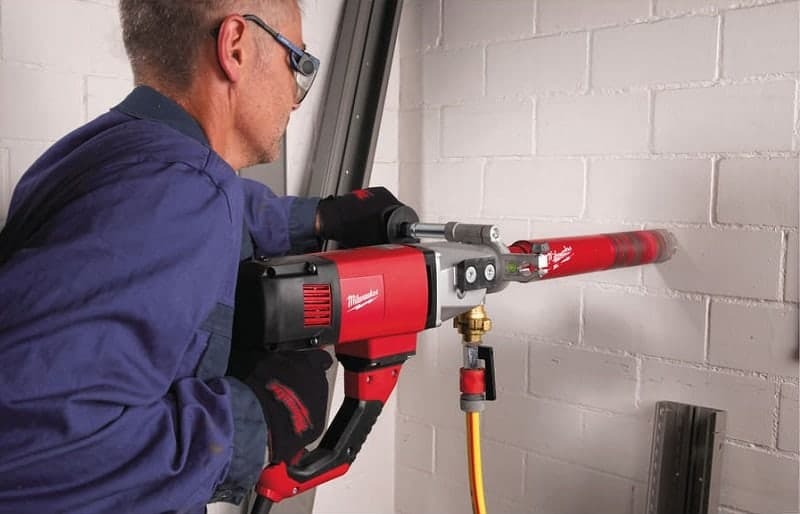 A strong, comfortable handle is another important feature on a portable core drill. Again, this will help prevent painful kick-back from occurring. You will have far greater control of the drill, (especially when used for drilling above the head), and should the bit jam there is far less chance of you coming to blows with your drill. Sometimes having the right drill for the job makes all the difference. Let’s walk through some choices among core drills, their characteristics and how they compare to one another. By the end of this review section, you should be able to decide on which type of drill is best for you. 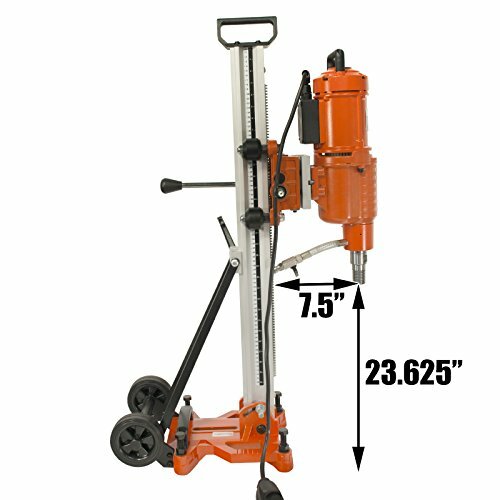 The Bluerock Tools concrete coring drill is a smaller version and comes in a durable hard-sided carrying case and weighs 22 pounds. It can drill 4″ maximum diameter holes and has a stand available for purchasing but not included. 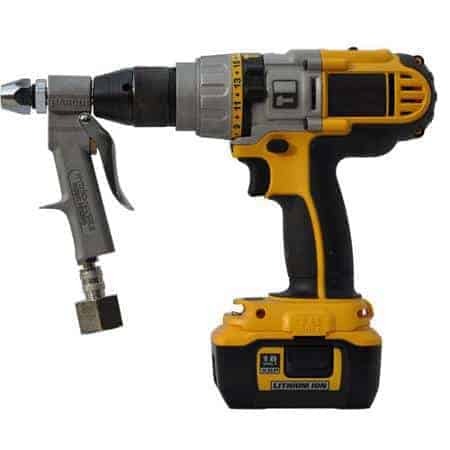 The drill has a 110 V motor and a rated frequency of 50 to 60 Hz. It’s rated input power is 1500 W. Because of its two-gear rotary speed, it is capable of drilling different sized holes. Wet drilling is possible due to the inclusion of an adaptable water spigot. There is a level on the side of the drill to ensure precise drilling and a hold down switch for added comfort. The drill’s collar measures 2 23/64.” This core drill comes with a safety clutch. 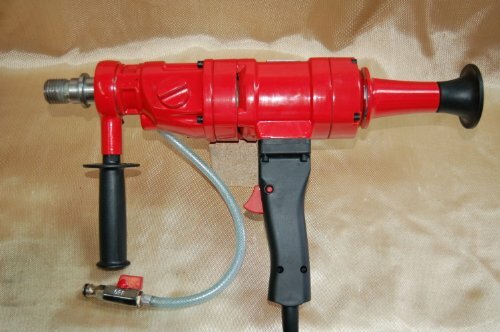 As we covered above, the core drill is a drill designed to remove a cylinder of material, which comes in handy in the field of construction to create holes for pipes, manholes, and large in diameter penetrations in stone or concrete. However, they are also useful for retrieving cores in mineral exploration. Geologists examine the core for mineral content and “stratigraphic” contact points. A portable, handheld version of the coring drill such as this from Bluerock Tools, is ideal for those that need to take their equipment out in the field. Works very well as a hand-held unit. Although a portable handheld core drill, it is still rather heavy. A minority of users have stated that the their holes sometimes slant downwards. 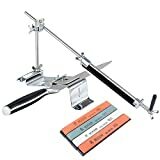 Based on the price, strength, and versatility of this tool, the Bluerock gets a super high rating and is more than worth the price. Customers seemed tremendously satisfied. 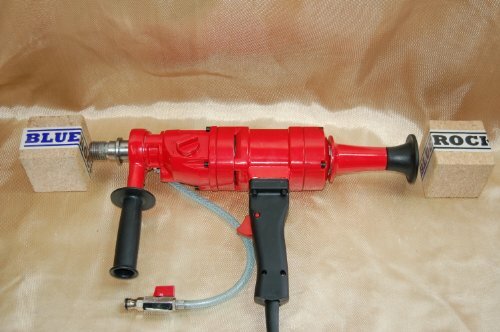 We would recommend it to anyone looking for a quality core drill at an affordable price. 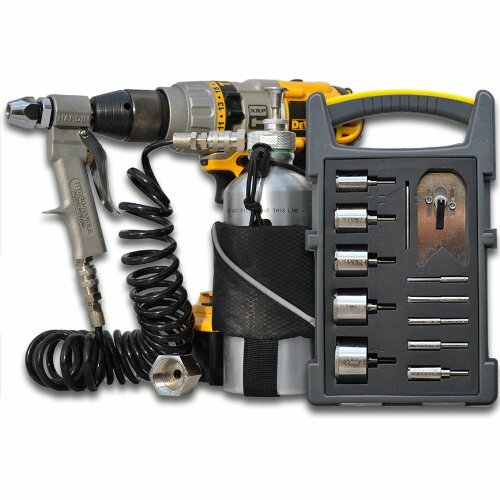 This drill kit from Hardin includes diamond bits sized 1.”, 5/16″, 3/8″. 1/2″, 3/4″, 1″, 1 3/8″, 1 1/2″, 2″. The granite, marble and stone vacuum brazed profile wheels, sold separately, can shape the edges of the stone materials. Another accessory included in the kit are the 3″ polishing pads, sold separately, that polish tile, marble, glass, stone and porcelain. The pads can also clean hard water marks on shower doors, windows, and glass on boats, making it a highly versatile tool. The Hydro-Handle Professional Plus boasts a portable lubrication system and a bit set that includes a bit guide and a case. 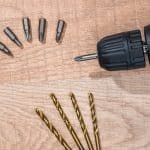 The kit also includes the 1/2″ to 5/8″ – 11 arbor system (to be used with standard 5/8″ to 11 threaded core bits), 8mm compression chuck, the quick-connect garden hose adaptor, an 8mm diamond pilot bit, an assortment of wrenches and an extra seal set. The drill also comes with an aluminum pressurized water bottle, a coiled water line, and a utility belt. 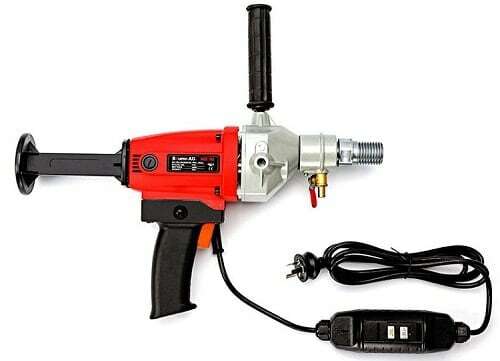 Suddenly, your cordless or corded drill will become a portable center water feed drill. The water, fed through the center of the attachment by way of the Hydro Handle, makes for the best possible cooling. If you think about it, this is a neat deal for this price range. The Hydro Handle also has an extra feature where it adds an extra support point close to the attachment for more secure grip and more leverage, control, and convenience. Excellent price given all its capabilities. not that good at drilling smaller holes, ironically enough. The affordable price and the various positive user comment stating that the bits can withstanding repeated drilling of holes makes this a close contender for our number one spot. This is a very useful, well built tool so expect to get quite a few years of dedicated service from it. 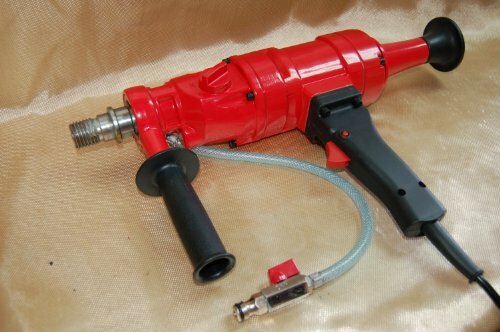 Another core drill from Bluerock Tools. This time we’re taking a look at the Z-1WS rig system. 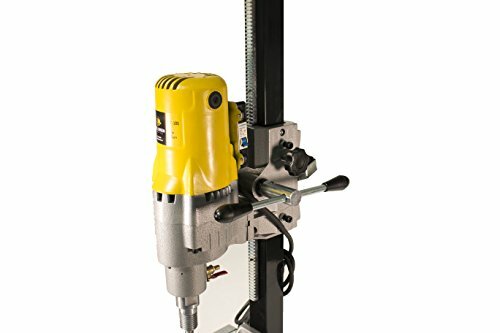 The drill itself weighs 40 pounds and uses 110 V. It drills up to 4″ diameter holes and can be used by hand or in conjuction with the drilling stand. Its rated frequency is 50 – 60 Hz, and it’s rated input power measures 1500 W.
The dual power modes are 2100 rpm and 950 rpm. The drill has two-gear rotary speed and is designed to drill holes of differing sizes. The top gear is for drilling smaller holes of 1″ to 2″. The bottom gear is for larger drill bits of 2″ to 4″. 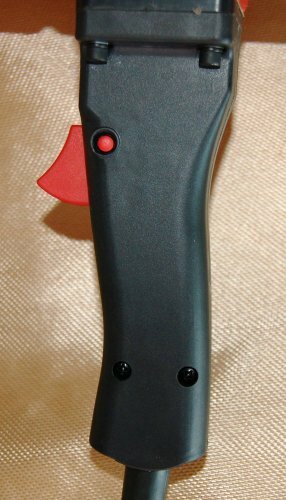 The Bluerock tool also has a safety clutch which is an important addition to help prevent painful kick-back. The drill is also designed to be portable and easily handled on its stand or by hand. It includes an adaptable water spigot for “wet” drilling and a level on the side of the drill for more precise drilling. It is equipped with a hold down switch for comfort and has two wrenches, three hex wrenches, two spare brushes, along with an adjustable carriage. Bluerock takes its tools seriously and provides customer service that goes beyond what is expected. They happen to have a good reputation because of their high quality after sales service. The company is rooted in an industrial background which plays a part in the knowledge available for manufacturing their products. The rig is built to high quality manufacturing standards. The user’s manual comes with some rather confusing instructions that can be hard to follow. Some users have stated that the water connection can be frustrating to set up. There were a few issues involving the drill needing adequate configuration before use. However, even though in several cases, some “tuning up” was necessary before the drill worked successfully, most customers have proven to be happy with the price and the capabilities of this tool. The Cayken rig is designed to be used for wet or dry core drilling and comes with an adjustable aluminum stand. 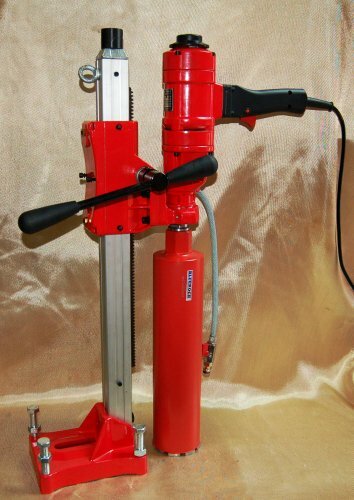 The drill can cut very large 10″ diameter holes in concrete, stone, brick, rock, ceramic, and fireproof materials. It is 36″ x 18″ x 12″ and has a 5.8 HP, 4,350-watt motor. Its spline is 1/4″ x 7 TPI, and the rig includes a safety clutch, as well as overload protection. Also included are a wrench set, two motor brushes, and a 1/4″ water valve with shutoff. 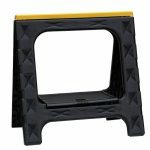 It sports a soft start electronic current limiter, and the stand is adjustable from 0 to 45 degrees. The rig contains a built-in leveling bubble and four adjustable slide bearings. Along with all these added benefits, the rig also has angle/vertical position locks. The larger mast is designed to accommodate large-diameter bits and to handle high torque levels. There are four leveling bolts on the base and a reversible slide handle for dual-side operation, in addition to top and rear handles. The rig weighs 34 pounds. Given all the fantastic features on this drill, it happens to be very affordably priced. Has a very large cutting capacity up to 10″ in diameter. The design is optimized for safety too. The speed can’t be adjusted, unfortunately. 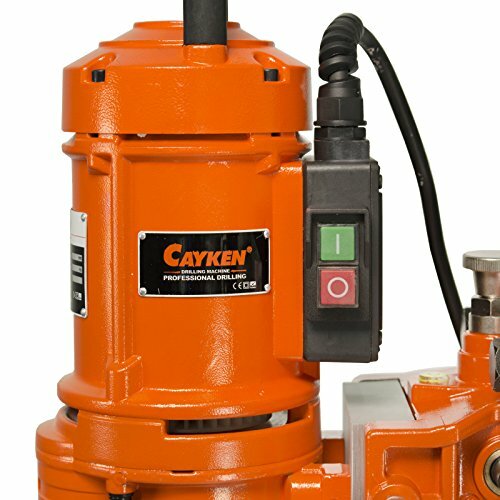 The Cayken Core Drill Rig is all inclusive and has the added features that make it a can-do machine. The price is right on, and the versatility is above standard. 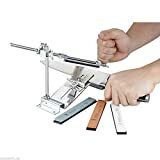 Highly recommended for professionals that need the extra wide cutting diameter and built in safety features. 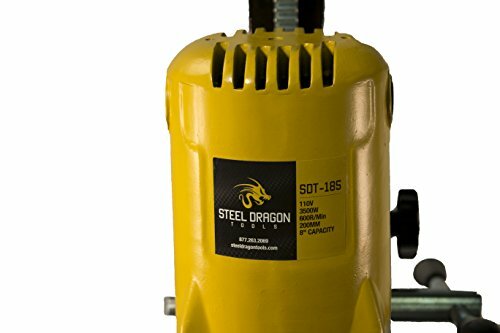 This core drill from Steel Dragon Tools can cut up to 8″ holes through concrete, asphalt, marble, stone, and granite. Its motor is a powerful 3500 watts and offers increased torque for handling the toughest drilling jobs that come your way. It comes with 60Hz and 15 Amp high-speed capability. The base is 8″ x 7″ with four bolts and brackets. The 2″ x 2″ column has a rack and pinion gear system for precise drilling depth. The diamond wet core drill bits measuring from 1 1/2″ to 14″. The spindle speed is 600 rpm, and the rig’s overall height is 34.” This machine has a one-year Full Warranty. 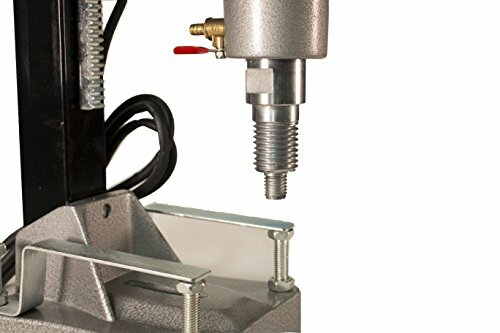 Four bolts attached to the base of the tool can be used to level device. Good cutting diameter of 8″. There seemed to be more negative comments for this drill than for all the rest combined. Although some were appreciative of the price, the number of incidents of the tool shutting down after being used were too many to ignore. 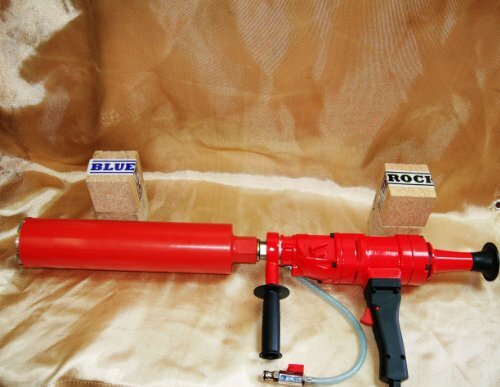 The weakest core drill in our top 5 review roundup. 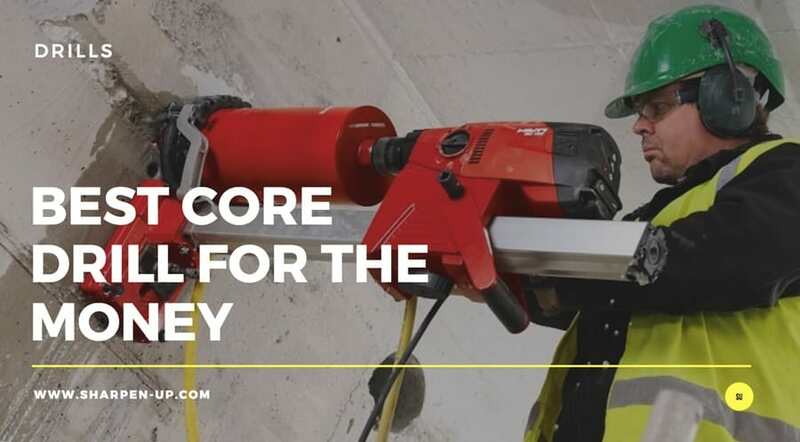 If after our top 5 review section you remain undecided on what core drill to buy, the short checklist below will help you narrow down your search when it begins. 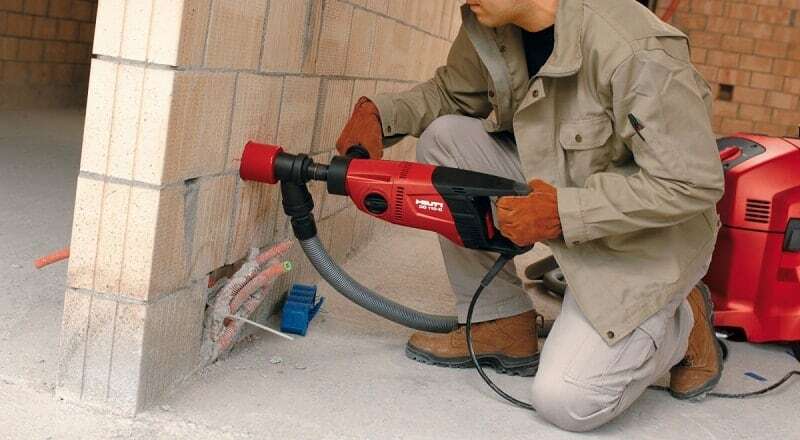 Remember, a high-quality core drill must accomplish difficult jobs like cutting through concrete, block, stone, masonry, and brick while not cracking or damaging the structure surrounding it. The type of device you should look for will use diamond bits, includes a high torque and a high RPM motor and will be built to last. Decide whether you want an electric motor, a hydraulic drill, or an air-powered machine. Settle on whether you want a handheld tool or a rig. Consider whether you want a gear mechanism that allows up and down movement. Be clear on what you will be using the device to do. Remember to include safety mechanisms on your drill, such as built-in GFCIs and mechanical slip clutches. Know that pros suggest using a handheld core drill when drilling holes up to 3,” but a rig for larger jobs. 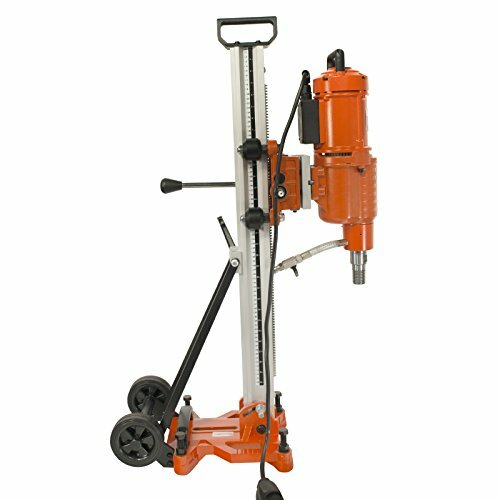 Look for rig-mounted drills with vacuum base that can mount the rig to the floor when a job requires the drilling of many holes. Ensure that when considering an electric core drill the tool has an indicator light that alerts the user when an overload is perceived. Know that experts have said that a roller carriage requires less adjustment than a slide carriage. Understand that aluminum stands are lighter than cast iron or steel, making them preferable easier to transport. When you find yourself in the market for a core drill, do your research by spending time on the Internet to learn, compare, and understand pricing. Preparation is always the best shopping tip. 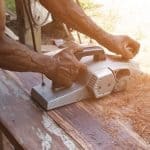 Look for a drill with a “quick-connect: chuck which speeds up bit-changing. Research the return on your dollar from renting a core drill or investing in one for your shop. Crawl the Internet for advice, recommendations, reviews, and information about core drill types, costs, life=span, and popular accessories. Check on warranties, repair options, availability of parts, and training are available.